(Bloomberg) -- Bernie Sanders’ army of fervent progressives will be up for grabs in 2020 even if the Vermont independent makes another bid for the Democratic presidential nomination. 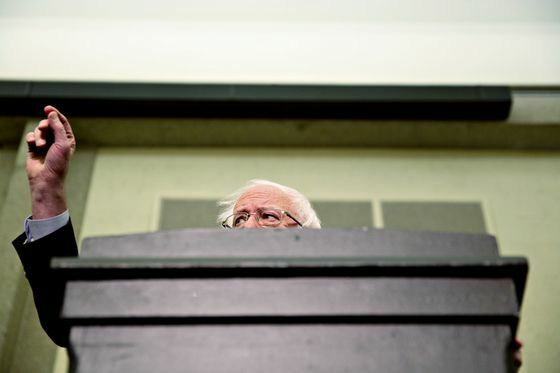 Sanders consistently polls well ahead of the other Democrats who’ve announced plans to run in the 2020 primaries and behind former Vice President Joe Biden, who also is considering entering the race and would be a moderate alternative. But polls also show that Democrats are more focused on nominating a candidate who can beat President Donald Trump than they are with policy positions Sanders used to drive his surprisingly competitive challenge to Hillary Clinton in 2016. Dean, a Sanders critic who endorsed Clinton in the last race, said that while many Sanders supporters felt he “got cheated” during the 2016 primary race, they voted for Clinton in the general election. “That phenomenon is going to be amplified 100 percent this time around because people really, really want change,” he said. Organizing for Bernie, a group founded by former Sanders staffers, is leading a coalition of pro-Sanders groups in a campaign to demonstrate that the senator still has support to sustain a potential campaign. The coalition includes Progressive Democrats of America and Our Revolution, which was formed in the wake of Sanders’ 2016 campaign. Some of those past supporters are weighing their options, or considering their own odds. Representative Tulsi Gabbard, a Hawaii Democrat and popular surrogate for Sanders in 2016, announced her presidential bid last month. Senator Jeff Merkley of Oregon, the lone member of that chamber to endorse Sanders, has said he’s considering a run. Adam Green, co-founder of the Progressive Change Campaign Committee, said Warren has been consistent on policy and “meets this moment” as Democrats seek to take back the White House. Green said he expects PCCC -- which coined the phrase “the Elizabeth Warren Wing of the party” and campaigned to encourage her to run for her Senate seat in 2012 -- will endorse Warren. In 2016 the group stayed neutral in the Democratic primary. As a CPC co-chair, however, Jayapal said she won’t be endorsing any candidates early. The caucus plans to invite candidates to meet with members for an interview, interact with them, and fill out a questionnaire on their policies on Medicare for all, debt-free college for all, infrastructure, collective bargaining and other issues, she said. Members of Democracy for America, which grew out of Dean’s 2004 presidential campaign, overwhelmingly voted to endorse Sanders in 2016, even though Dean supported Clinton. Charles Chamberlain, executive director of the group, said it’s unclear whether any candidate will gain the support of a supermajority of members, the threshold required for an endorsement. New Jersey Senator Cory Booker became the latest Democrat to enter the race, joining California Senator Kamala Harris and former HUD Secretary Julian Castro. Senators Kirsten Gillibrand of New York and Warren of Massachusetts have announced exploratory committees, and Senator Amy Klobuchar of Minnesota is expected to announce her campaign plans on Sunday. A wider field of mayors, governors, business executives and members of Congress are also weighing runs. “Inclusive populism is clearly the future of the party, it’s the future of America, it’s what people want to see,” Chamberlain said.